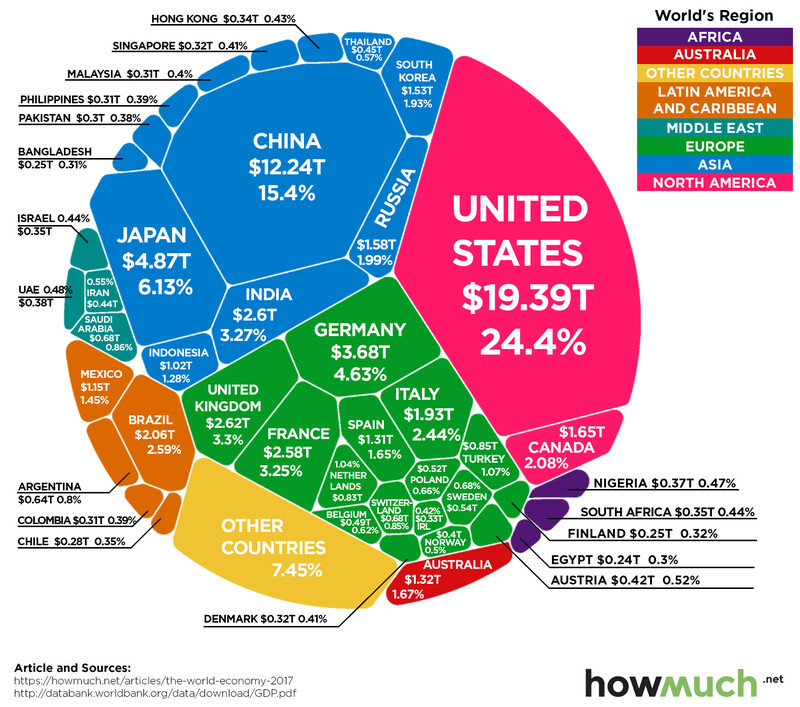 Today’s chart from HowMuch.net uses this data to show all major economies in a visualization called a Voronoi diagram – let’s dive into the stats to learn more. Here are the world’s top 10 economies, which together combine for a whopping two-thirds of global GDP. In nominal terms, the US still has the largest GDP at $19.4 trillion, making up 24.4% of the world economy. India has now passed France in nominal terms with a $2.6 trillion economy, which is about 3.3% of the global total. In the most recent quarter, Indian GDP growth saw its highest growth rate in two years at about 8.2%. Brazil, despite its very recent economic woes, surpassed Italy in GDP rankings to take the #8 spot overall. Turkey has surpassed The Netherlands to become the world’s 17th largest economy, and Saudi Arabia has jumped past Switzerland to claim the 19th spot. China will soon catch up. Turkey making some big jumps there.